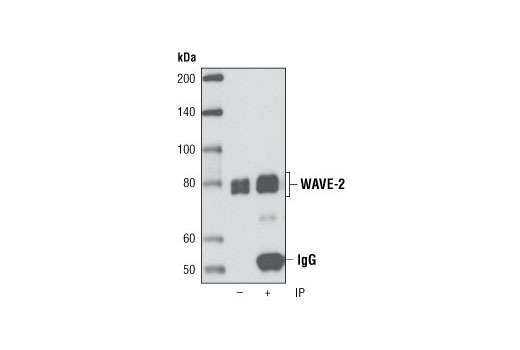 WAVE-2 (D2C8) XP® Rabbit mAb detects endogenous levels of total WAVE-2 protein. 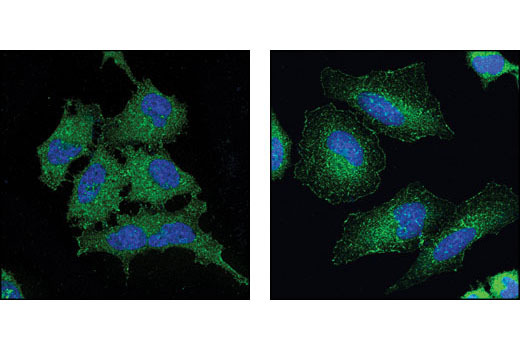 Monoclonal antibody is produced by immunizing animals with a synthetic peptide corresponding to central residues of human WAVE-2. Wiskott-Aldrich syndrome proteins (WASPs) mediate actin dynamics by activating the Arp2/3 actin nucleation complex in response to activated Rho family GTPases. In mammals, five WASP family members have been described. Hematopoietic WASP and ubiquitously expressed N-WASP are autoinhibited in unstimulated cells. Upon stimulation they are activated by cdc42, which relieves the autoinhibition in conjunction with phosphatidyl inositol 4,5-bisphosphate. Three WAVE (Wasf, SCAR) family proteins are similar in sequence to WASP and N-WASP but lack the WASP/N-WASP autoinhibition domains and are indirectly activated by Rac (reviewed in 1). Both WASP and WAVE functions appear to be essential, as knockout of either N-WASP or Scar-2 in mice results in cardiac and neuronal defects and embryonic lethality (2,3). Loss of WASP results in immune system defects and fewer immune cells (4). WAVE-2 (WASF2) is widely distributed, while WAVE-1 and WAVE-3 are strongly expressed in brain (5). WAVE-3 may act as a tumor suppressor in neuroblastoma, a childhood disease of the sympathetic nervous system (6). 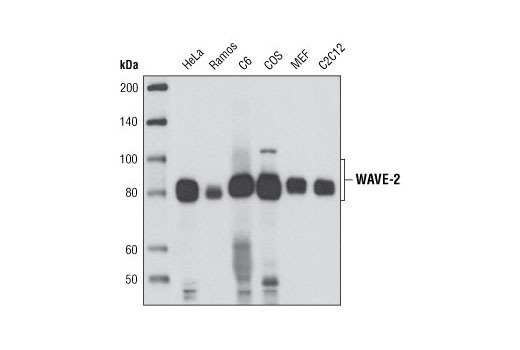 Increased expression of WAVE-3 is seen in breast cancer, and studies in breast adenocarcinoma cells indicate that WAVE-3 regulates breast cancer progression, invasion and metastasis through the p38 mitogen-activated protein kinase (MAPK) pathway (7,8). Yan, C. et al. (2003) EMBO J. 22, 3602-3612. Snapper, S.B. et al. (2001) Nat. Cell Biol. 3, 897-904. Zhang, J. et al. (1999) J. Exp. Med. 190, 1329-4132. Sossey-Alaoui, K. et al. (2002) Oncogene 21, 5967-5974. Sossey-Alaoui, K. et al. (2005) Exp. Cell Res. 308, 135-145. Sossey-Alaoui, K. et al. (2007) Am J Pathol 170, 2112-21.